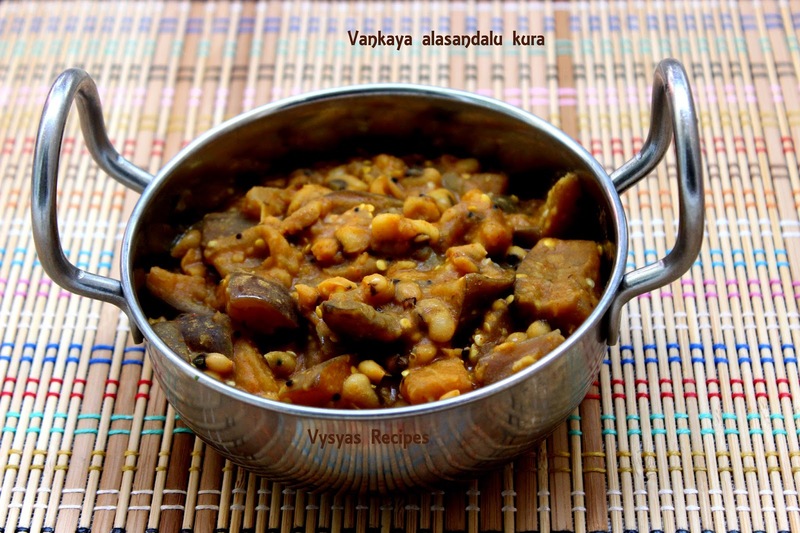 Badanekaayi Palya(vankaya koora) is prepared with with brinjal and black eyed peas.Main health benefits of black-eyed peas is their high fiber content. Fiber also helps keep your cholesterol levels healthy by preventing cholesterol from being absorbed into your bloodstream, which reduces your risk of developing heart disease.Eggplant commonly known as brinjal is an easily available vegetable in India. This vegetable contains lots of vitamins and minerals like Vitamin A, Vitamin B1, B2, B3, and minerals like potassium, calcium and iron. Brinjal is also rich in dietary fiber.Now we prepare a poriyal with these two healthy ingredients. tamarind - small piece. [size of 2 gems]. karamani (black eyed peas)- 3 tbsp. prepare tamarind extract with needed water. Heat the oil, add mustard seeds,when it splutters add brinjal, (after draining water), saute it for couple of minutes. when it turns little soft,add tamarind extract , when it starts boiling, add chillipowder,salt,jaggery.mix well. when raw smell of tamarind extract goes off, add cooked lentils(black eyed peas),cook for few minutes till everything combines well. Not necessary to soak the lentils, just cook for 5 to 6 whistles. Instead of chilli powder, you can add sambar powder also. you can add a tsp of coriander powder for extra taste. It goes very well with rice, chapati and dosa.